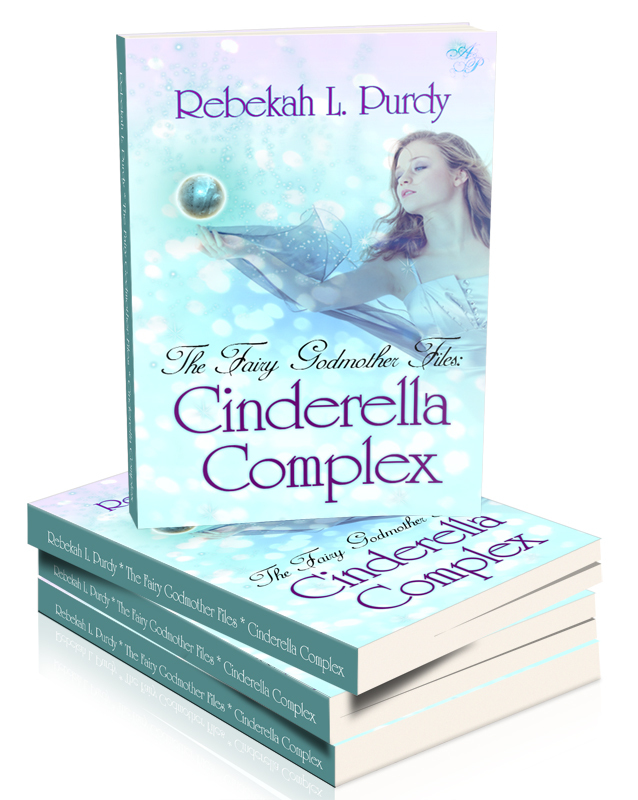 Rebekah L Purdy celebrated the launch of her latest book The Fairy Godmother Files: Cinderella Complex last week. The book, published by Astrea Press, is the third in two years for this extraordinary mom of six from Greenville, Michigan. The story of teen fairy godmother Maggie Winters follows My Dad’s a Paranormal Investigator: Seeking Shapeshifters (the follow up to which is her current project) and Staking Shadows, a darker tale of forbidden love in a post-apocalyptic setting. Rebekah’s output is even more impressive when added to the fact that besides six children and a menagerie of pets, she commutes 120 miles every day to a fast-paced job in the court system. Keeping family time and writing time separate is important to Rebekah, although her husband and children understand if she needs to take time out to meet a deadline. Her own family background has played a huge part in her writing career. “When I was in middle school my mom and dad bought this really old house,” she remembers. There was always crazy stuff happening. But two events in particular still stand out to me. One was when I was home babysitting my siblings (who were playing upstairs). I was just finishing up the dishes when I heard a knock on the door behind me. I went to answer the door, but no one was there. But in the window, I saw my reflection and the reflection of a man standing behind me. When I turned around, no one was there. Her latest project is a follow up to her 2011 success “My Dad’s a paranormal Investigator: Seeking Shapeshifters.” This new book sees Ima travel to Ireland, a country close to Rebekah’s heart. Says Rebekah: “Ireland is beautiful. The countryside is amazing and the people I met were so nice. It’s almost like time stands still. Driving in the morning, seeing the fog roll over the hills, breathtaking. 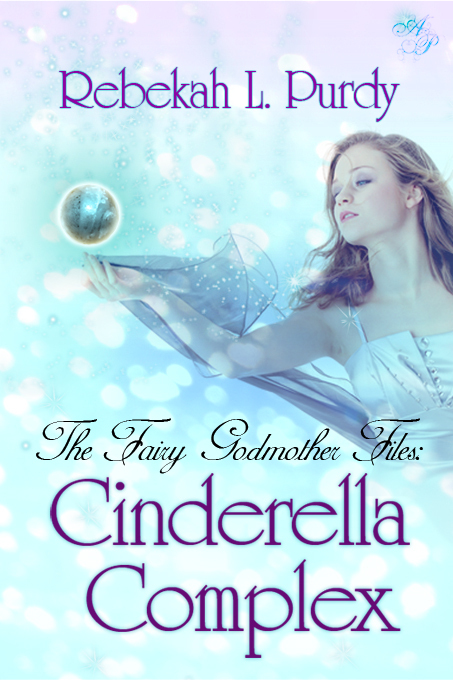 There’s no doubt we’ll all be sharing those adventures at some future date, but for now, Rebekah L Purdy fans have a new heroine in Maggie Winters, the narrator of the Fairy Godmother Files. Maggie’s adventures, both funny and scary, her friendships, romances and heartache are a page-turning read. Rebekah’s trademark blend of humour, drama and romance has never been better and the good news is, there’s not one but two follow-ups on their way. To celebrate the launch, Rebekah’s offering an ebook to one lucky commenter. So drop me a line and you may be the one! Over the last couple of week I’ve been tagged by three people – Traci Kenworth, Jennifer Fischetto and Vanessa Barger, so I thought it was about time I stopped fannying about and stepped up to the mark. So, after a bit of a false start earlier today, here are seven lines from the seventh line down on the 77th page of my wip. Igor shifts in his seat. “A code?” He glances at me. I press my lips together, biting down on the compressed flesh. That’s not good news. A language can be translated. But a code must be cracked. The old man fixes him with a steely glare. 3. Copy down the next seven lines, sentences, or paragraphs, and post them as they’re written. 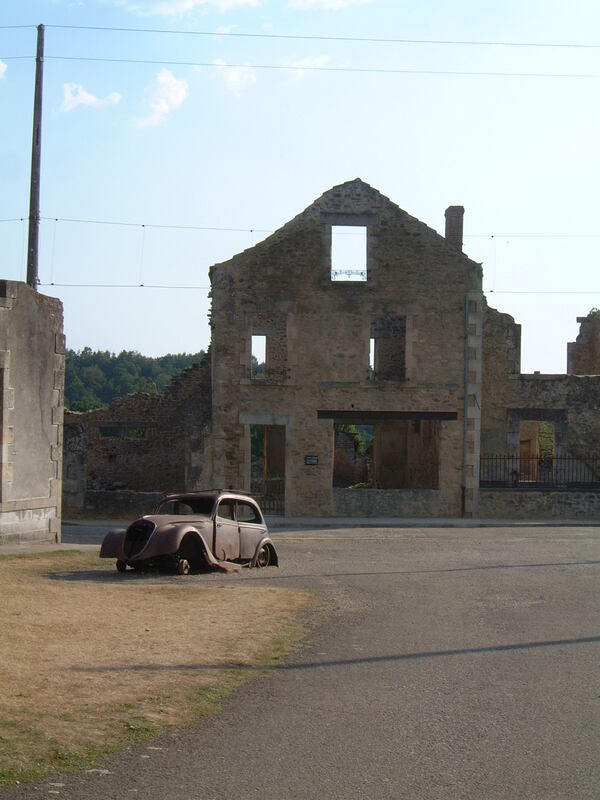 Whereas last week’s village, Oradour-sur-Glane, was a stark reminder of the evil humankind is capable of in war, this one, Naours, shows us just how tenacious we can be when our world becomes a battleground. 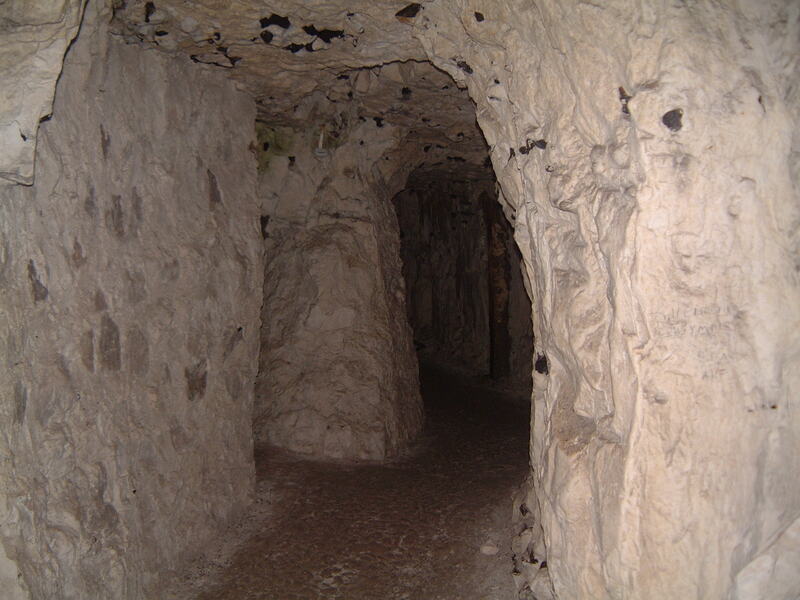 Up to 2,000 people at a time found refuge in this underground complex while war ravaged the northern French countryside they lived in. It was used during dozens of conflicts over hundreds of years, from the Barbarian invasions of the Roman Empire in the third century right up until the French Revolution. What’s left isn’t pretty. It’s grim and gritty and basic, exactly what you’d expect somewhere used as a place of safety in troubled times to look like. 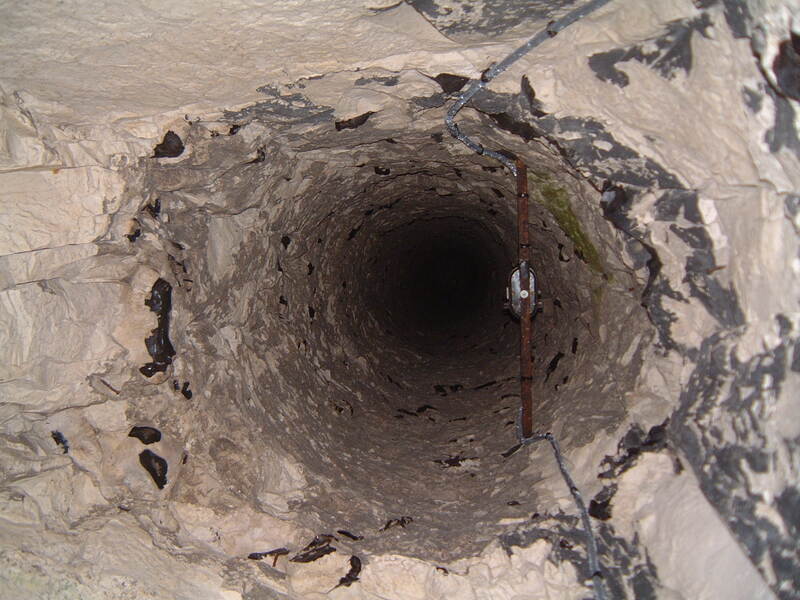 The tunnels fell into disuse after the revolution until their rediscovery by a priest a century later. 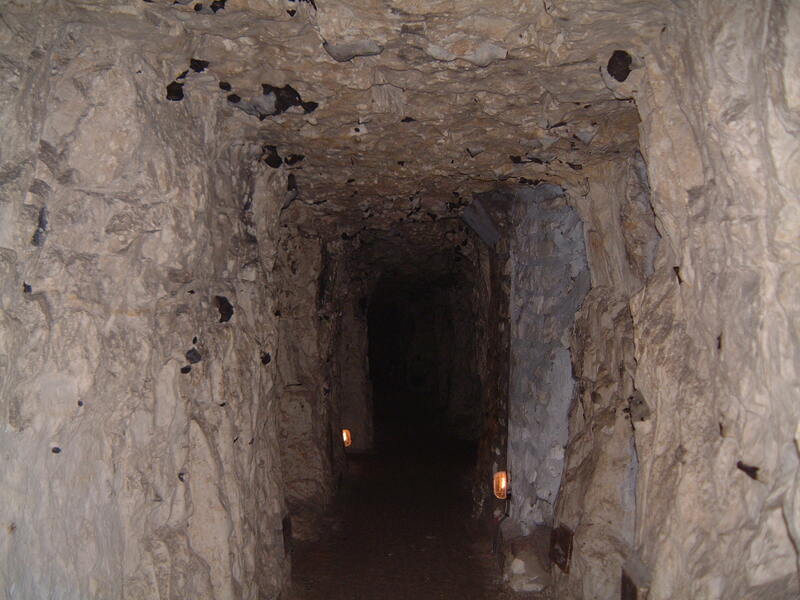 English troops used them during the First World War; during World War II, the Nazis used them as a munitions dump and Rommel’s staff headquarters. Two kilometres of excavations on three levels contain 300 rooms, 28 galleries, 12 public rooms, a chapel, six chimneys, a jail and a law court. Between five and eight people shared rooms, which were staggered on either side of passages to give some degree of privacy, which in these cramped and uncomfortable conditions, must have been essential. Imagine the heat, the smell, the whispered conversations. 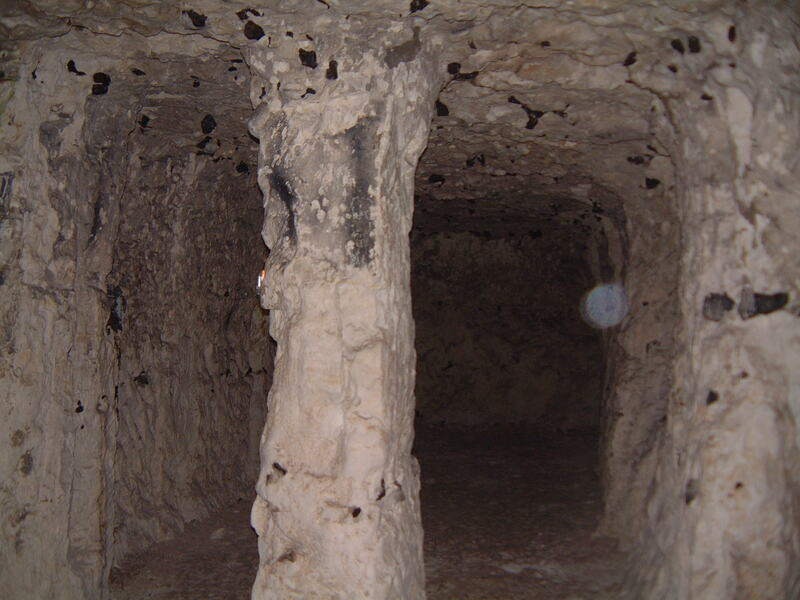 The flow of human traffic through the chalky tunnels, animals tethered to the walls, possessions piled in corners. Listless children playing in the shadows. Women crowded under the chimneys, cooking, knowing their smoke was routed up through a nearby miller’s cottage but worrying all the same their hiding place would be discovered. In short, this must have been a very crowded and tense place to live. Yet at the same time, a very hopeful one, where that basic will to survive joined forces with human ingenuity, determination and endurance. Like I said, not a pretty place. But an evocative one. A fascinating one. And a powerful one. 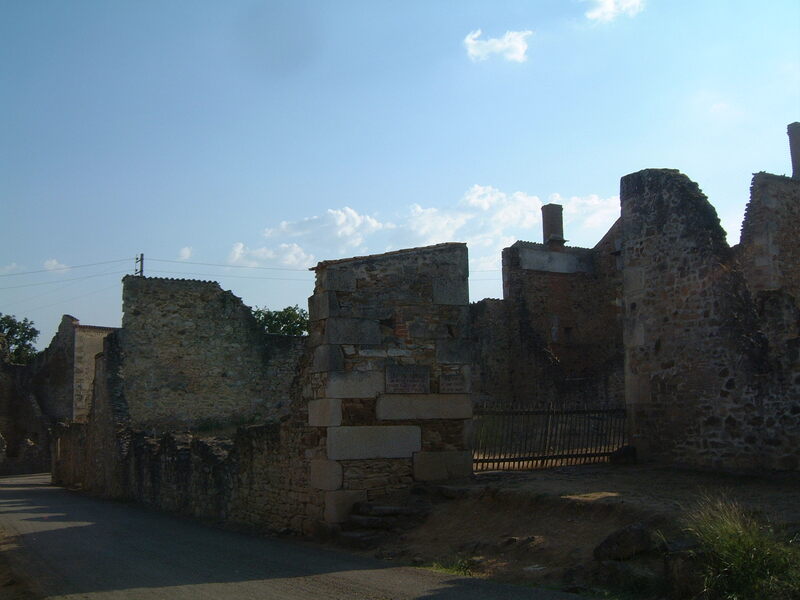 The ruined village of Oradour-sur-Glane is one of the most chilling places I’ve ever been. Even on a warm summer afternoon, the knowledge of what happened here on a similar sunny day, June 10, 1944 brought a shiver to my skin and a sick twist to the pit of my stomach as I walked through its shattered streets. 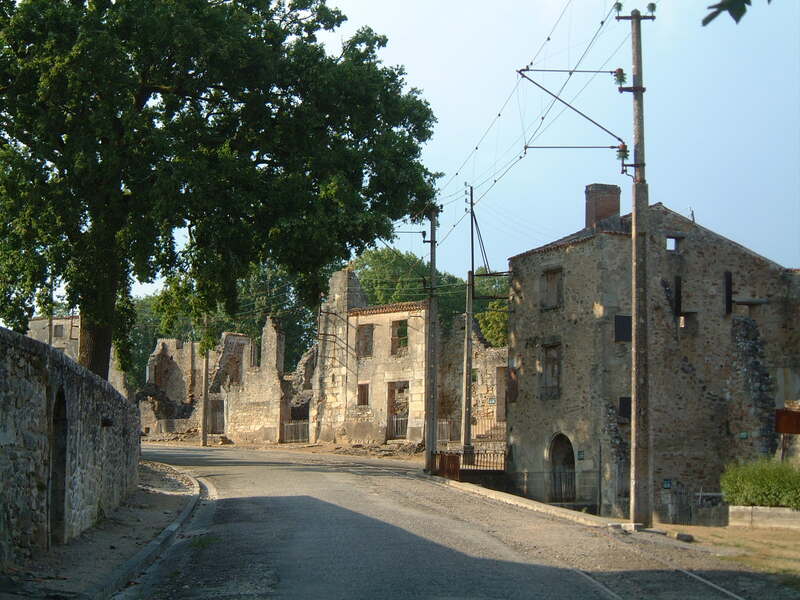 It was a Saturday, just after lunch, when around 200 Nazi SS soldiers rolled into the sleepy village near Limoges in south west France. No-one knows exactly why; it’s possible they confused it with somewhere with a similar name and links to the Resistance a few miles away. They ordered every man, woman and child to the village green, claiming they wanted to check identity papers. The men were separated from the women and children. They were taken in groups to barns and sheds like the one below, where they were first shot in the legs, then covered with fuel and set alight. The women and children were marched to the church. The soldiers set off an incendiary device, locked them inside and machine gunned anyone who tried to escape through the windows. Six hundred and forty two people, aged between one week and 90 years died: 190 men, 247 women, and 205 children. A handful survived to tell the world what they had seen. The soldiers looted and burned the village that night. Its silent ruins now stand as a memorial for those who died here and a reminder of the horrors of war. Burned out cars rust outside the shells of buildings. Sewing machines, bicycles and other souvenirs of stolen lives lie amongst the rubble. The buildings are marked with the names of the people who lived and worked in them; victims of a terrible atrocity that can never be forgotten. 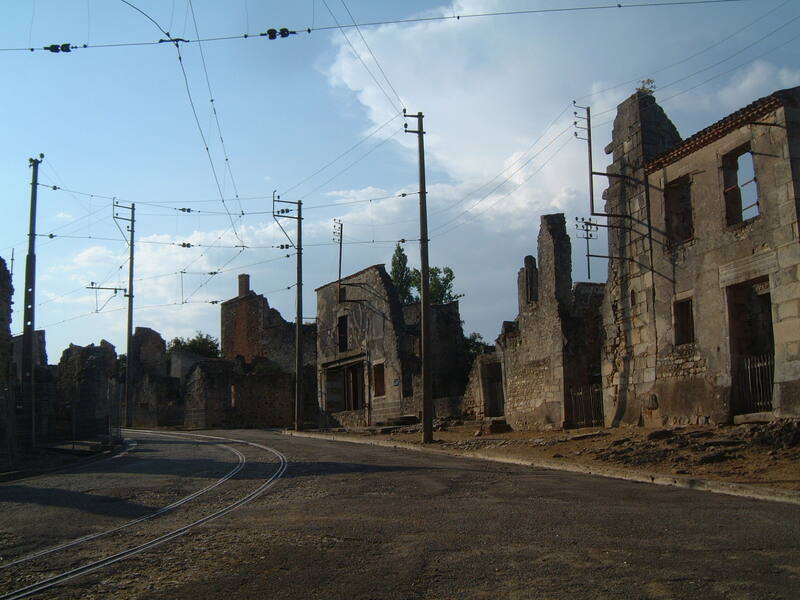 Oradour-sur-Glane is worse than any imagined horror story. What happened here is real. To real people, with real lives, who lived and loved and laughed and had no idea when they woke up that morning they’d be dead by nightfall. 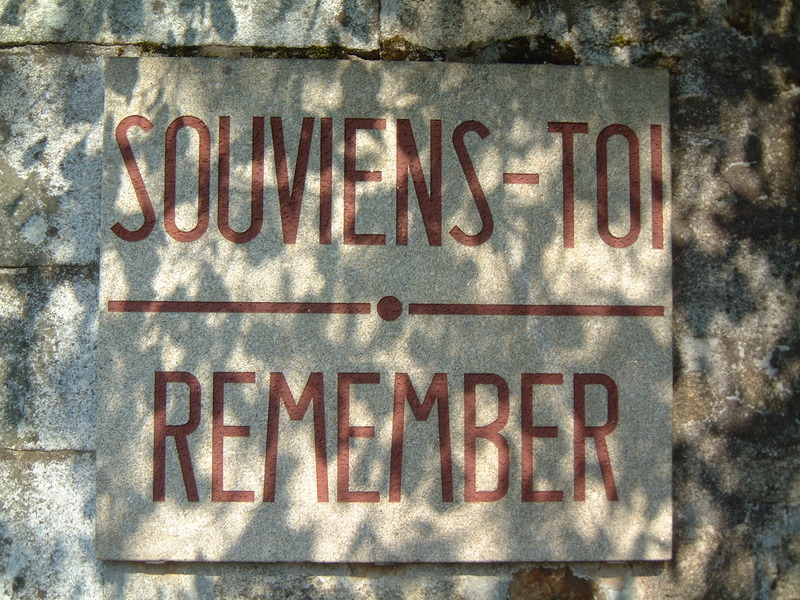 This martyred village is a place of remembrance and a reminder of the evil that human beings are capable of. I will never forget it. 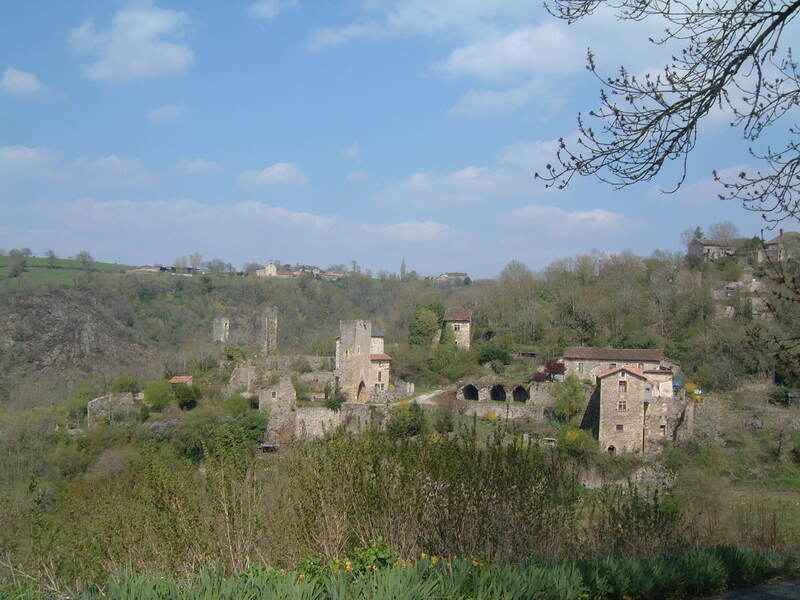 Peyrusse le Roc, Aveyron, France. 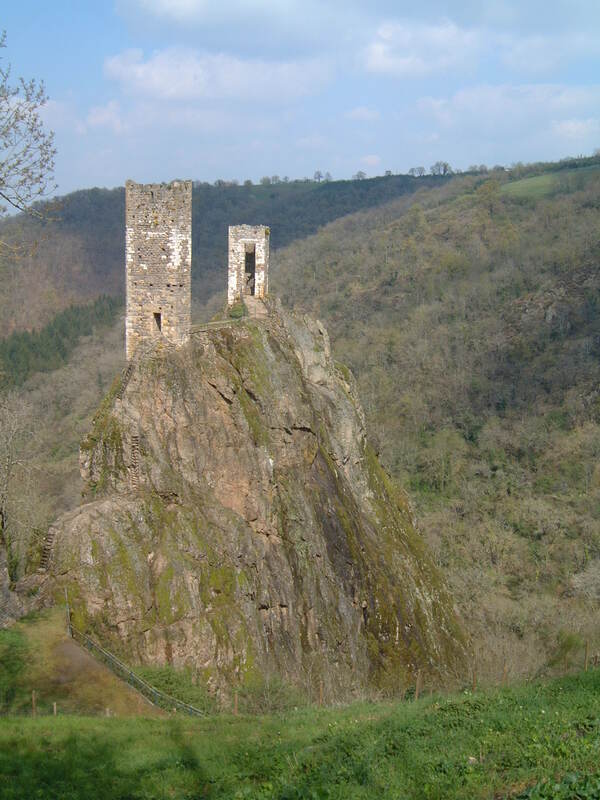 The ruins of Peyrusse le Roc, deep in the heart of France’s rural Aveyron, have an atmosphere of beautiful abandonment that even now, almost ten years after my visit, infuses many of my favourite daydreams. 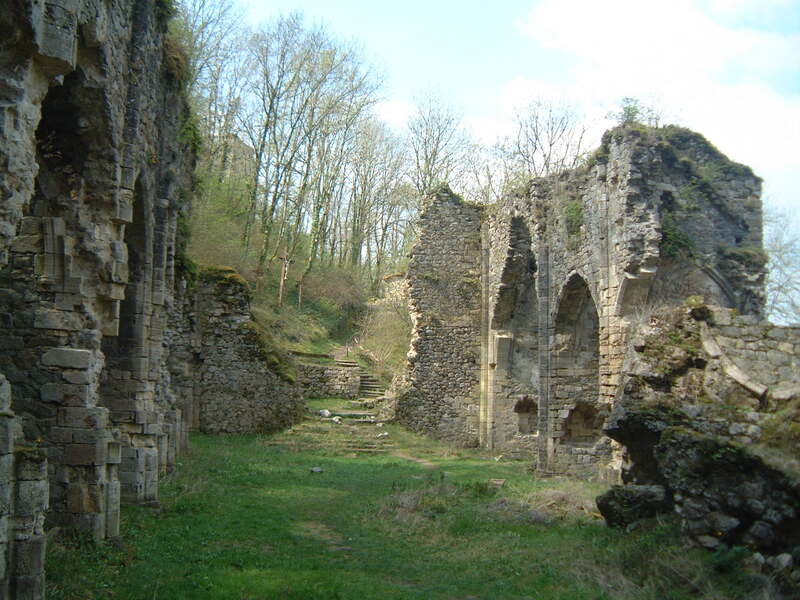 Its once magnificent buildings moulder in leafy splendour down the steep side of a wooded valley and dozens more lie in ruins at the edge of the more modern village at the top of the hill. Dominated by the skeletal towers of the “Chateau Inferieur” perched on top of the sheer sugarloaf of the Roc de Thaluc, this medieval village once thrived on a silver mining industry and was a local centre of political power. But when cheaper silver began to be imported from the new world, its fortunes changed; the bureaucrats moved to another town and the inhabitants of Peyrusse le Roc drifted away. I remember the climb to the top of the castle up a series of iron ladders embedded in the side of the Roc de Thaluc. Vulnerable, exposed, yet flushed with adventure, we made our way up to the towers that once dominated the valley, then down once more, to a tiny flight of steps which leads to a little building sheltering an ornate 14th century sarcophagus. 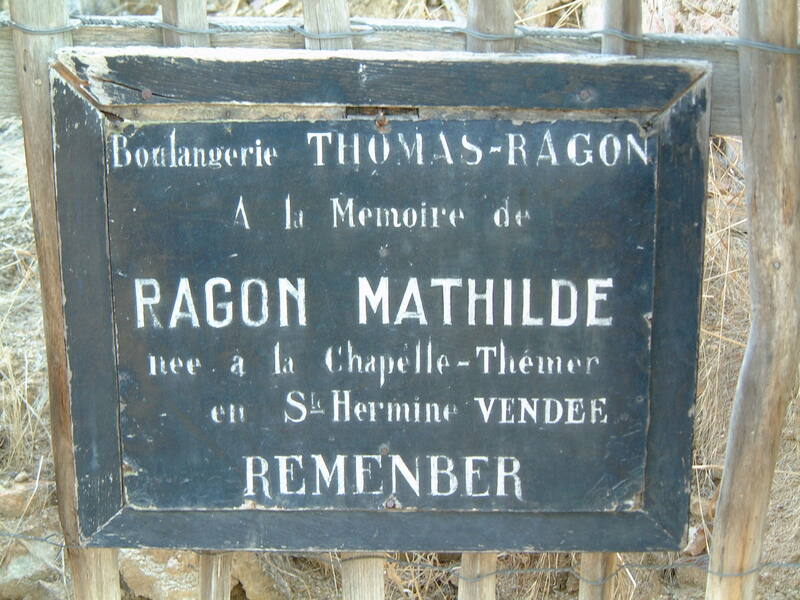 This was discovered by the villagers as recently as 1957 and is known as the “Tombeau du Roi”, although no one knows the identity of its occupant. 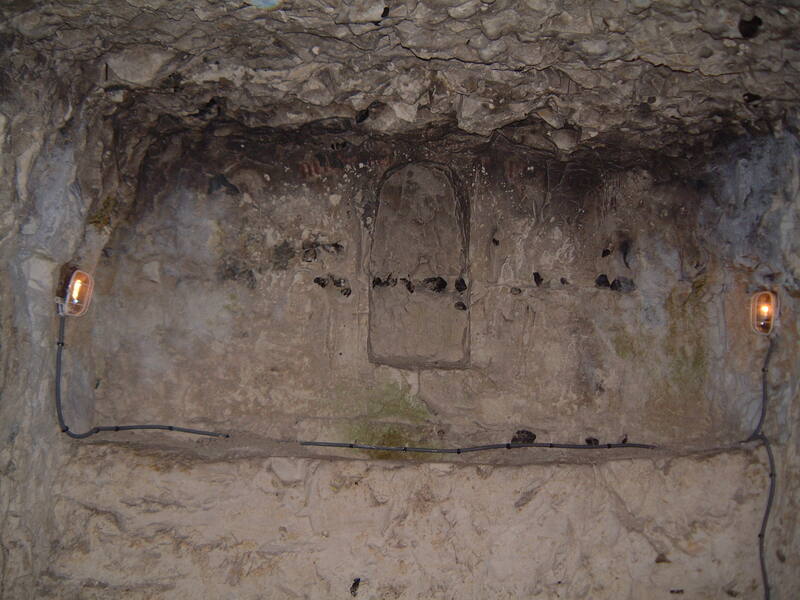 The hole in which it was found is still visible in front of the tomb; it goes down about 6.5 metres and many other skeletons, separated by thin slabs of mortar, were found there too. 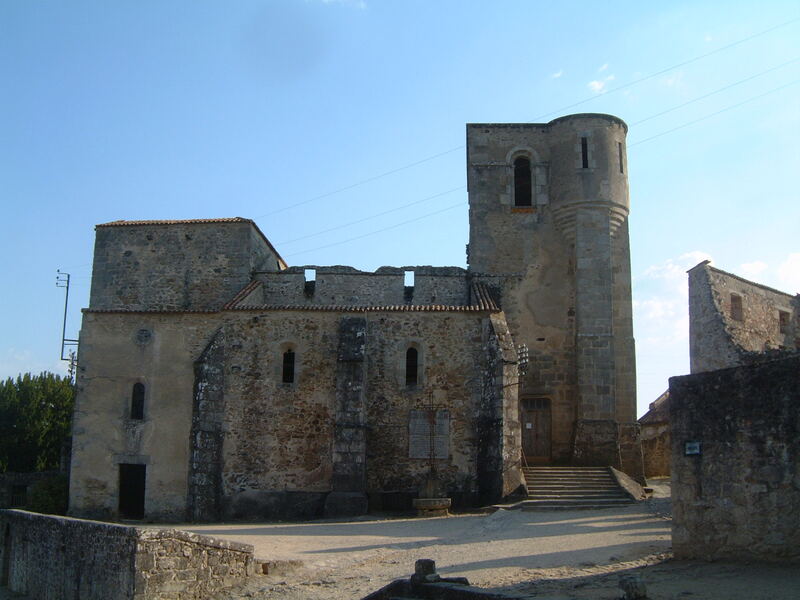 Further down the hill is the village’s most spectacular building, the magnificent ruin of Notre Dame de Laval, which was built at the end of the fourteenth century and abandoned in 1680. Overshadowed by the black, grey and apricot Roc de Thaluc, its once imposing nave, choir and twelve side chapels now are carpeted with grass, nettles and wildflowers. 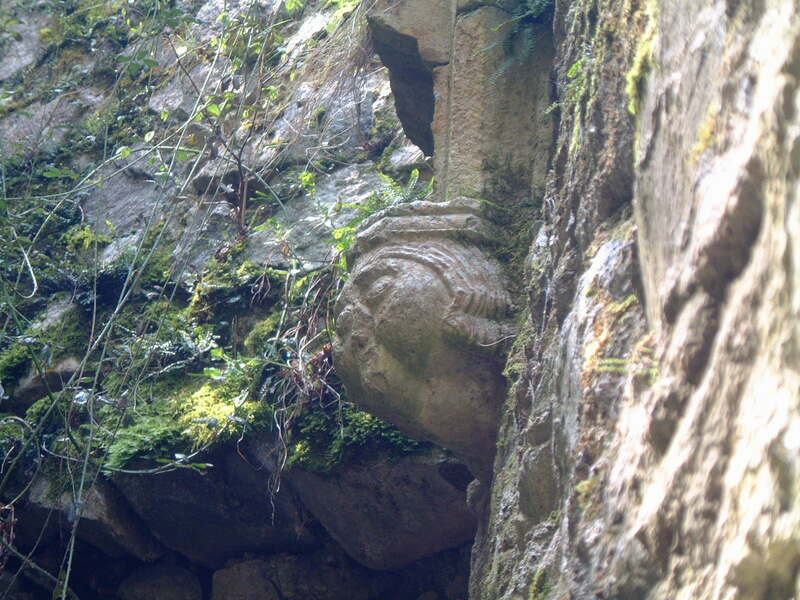 Ferns have colonised the walls and towards the choir, on the north side, looking out over the valley, two of these lateral chapels have collapsed into a huge block of mossy masonry. This must come close to what the romantics must have seen when touring the ruins of England’s abbeys and priories, before the age of gravel paths, entry fees and mass tourism. It’s one of the most beautiful places I’ve ever been. Continuing down the path, bordered on one side by the astounding foundations of this building, we came to a smaller structure nestling into the rock itself. This building, known as the synagogue, is made up of a fortified tower backed by a less well defended building. 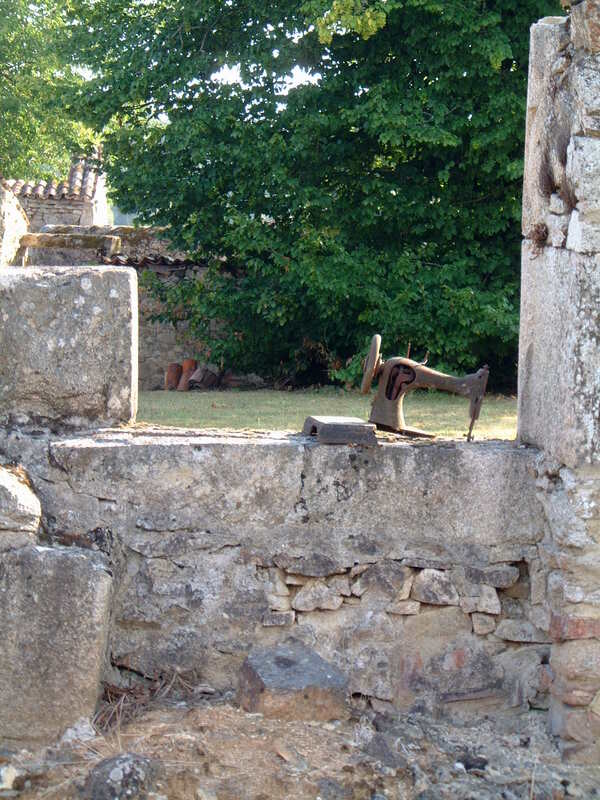 From there, we walked through the woods to the foot of the hill, where by the side of the river, is the 13th century “Hopital des Anglaises.” It’s a large rectangular building with a fireplace on the top floor and would have been used not only for treating the sick but for housing the poor and lodging pilgrims. In front of it is a bridge and about 100 metres away is the Chapelle de Notre dame de Pitie et la Pieta, which may have originally been an oratory serving the hospital. 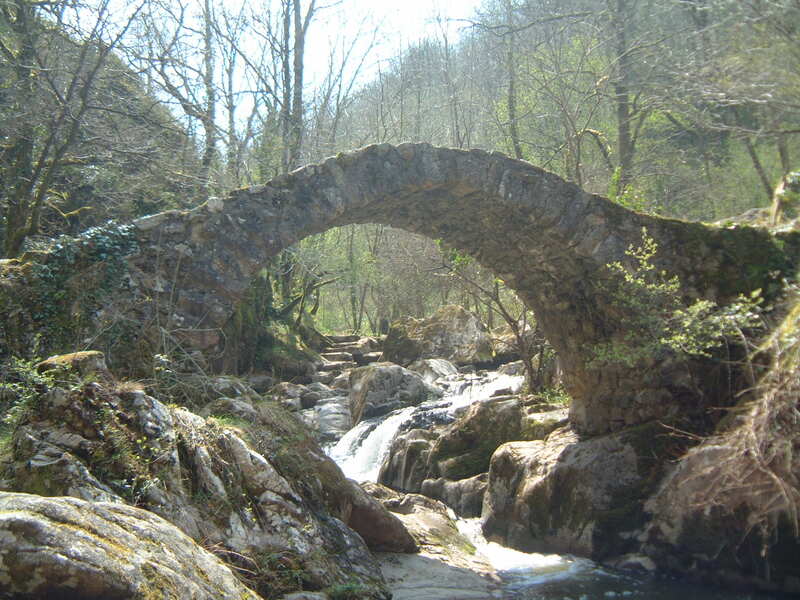 We continued to the very ancient Pont du Parayre, noting the green man painted on a rock by the riverside, then up past the ruined miller’s house to the Chateau Inferieur. Walking through a ruined street, we doubled back towards the village, through the ruined fortified gate known as La Porte de la Barbicane to the remains of the covered market, which once housed 13 arched stalls, although only three remain today. We followed the signs though more ruins, to a charming medieval garden, then back to the “modern”village square. Whereas last week’s village, Tidemills on the Sussex coast, whispered to me of our impermanence, this one sings of the romance of ruination, of how abandonment can transform a settlement into something different, something beautiful, something that resonates in the soul and remains with us for the rest of our days. There’s not much left of the once thriving community at Tidemills, near Newhaven on the Sussex coast. A few crumbling walls, the old tidal millpond, traces of a railway. On a chilly winter’s day, when the wind whips in from the sea and waves pound the shingle beach like it’s done something wrong, it’s hard to imagine anyone ever living here. But they did. And in its boom years, their village must have seemed as permanent to them as our towns and cities do to us. Then, at the end of the nineteenth century the redevelopment of the nearby port closed the tidal creek to barge traffic and the coming of the railways made it cheaper for farmers to send their grain to market than have it milled locally. The mill shut down; the settlement fell into decline and in the 1930s, after several houses were declared unfit for human habitation and demolished, it was dubbed “Britain’s most backward hamlet” by a national newspaper. It was finally cleared in 1940 as part of the country’s sea defence strategy and used for street fighting practice by Canadian soldiers stationed nearby. A memento mori of brambles and broken bricks, Tidemills is a whispered reminder of how our own certainties are built on shifting sand. And while nothing lasts forever, I suspect the relevance of that message will endure for a very long time.